Laser hair removal is a very common method for removing unsightly hair for the longer term. Our laser/IPL targets the hair follicle so it produces less hair. Our laser/IPL can be performed on any area of the body. Unlike shaving or waxing, laser hair removal doesn’t need to be done on a near-daily basis, and with repeated treatments hair growth will slow further. At Re-Nu Skin we recommend a minimum of six treatments for best overall success. Laser hair removal works by targeting the pigment in the hair and either damages or destroys the hair follicle, thus then preventing any future hair growth at theta area. There is minimal discomfort at the area and the is cooled during treatment with our Lynton Lumina medical grade laser/IPL machine. There may be some swelling or redness at the are for around 24-48 hours post treatment. The hair then falls out at around 1-3 weeks after the treatment. this is resulted due tot he hair being pushed out of the new epidermis. Our N:d YAG allows us to safely treat ALL skin types through to type 6. As our hair grows at different rates and some hairs are stronger than others it is recommended a course of 6 treatments is carried out. Stubborn areas may require top ups. Intense Pulsed Light Technology (IPL) is a safe and non-invasive hair reduction approach that uses pulses of light, which focus on the hair follicles in order to remove undesirable hair. IPL uses light across a broad spectrum, with filters that target the dark pigment of the unwanted hairs. As hair is removed directly from the root, there’s less chance of regrowth compared to that of using razors or creams. If it does grow back, hair is often much finer than before, although, as with any kind of hair reduction treatment, a permanent solution isn’t always guaranteed. Treatment is carried out in our laser room where you will be comfortably seated wearing protective goggles throughout the treatment. Cooling gel that resembles ultrasound gel will be placed on the areas to be treated prior to the IPL being placed on the area. Clients often resemble the light hitting the skin as to that of an elastic band snapping onto the skin. The area is cooled via our built in cooling system and a cooling gel may be applied to the area post procedure. You will be given a post procedure aftercare leaflet for advice which should be followed. 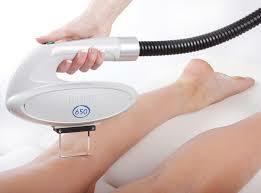 IPL has many advantages over other forms of hair removal. Shaving, waxing, depilatory creams and electrolysis can be very time consuming and are not suitable for everyone. As IPL only uses light, many of the skin problems associated with other forms of hair removal such as ingrown hairs and rashes are eliminated. Unwanted black hairs are most easily treated by intense pulse light (IPL) due to the large concentration of melanin in these hairs, which gives an optimal absorption of energy. Grey and white hair has almost no melanin and cannot be effectively treated. The upper layer of skin, the epidermis, also contains melanin and the concentration increases when the skin is exposed to UV light in the form of a tan. It is therefore essential that sun tanning be avoided during treatment, and sun screen should be worn. Fake tan should not be applied 2 weeks prior to a treatment. IPL (intense Pulse Light) is a treatment which delivers the cosmetic benefits of light technology and is suitable for unwanted hair removal from the face and body, helping to give you an even skin tone and younger looking skin. There are some side effects that are common and can be expected with IPL hair removal. These include slight redness of the skin, slight swelling, and a feeling of soreness. Your skin may feel a little like it is sunburnt. However, these kinds of side effects should only last a day or two. There is also a chance that there may be some slight pigment change in the area of skin where you had the procedure. This can either make your skin slightly lighter or darker in patches. Darker ‘patches’ will be more like dots of sun-tanned skin which have tanned in spots where the light acted. If your skin goes lighter, however, it will be in slightly larger, but nevertheless very small, patches, where your skin’s pigment has absorbed too much light. Darker skin tones are more prone to this than light ones. If your skin’s pigment changes, either darker or lighter, this should fade in time, but may take a few months. Thankfully there are not many major serious complications or risks with IPL, as it has been developed to be as safe as possible. Most side effects, such as redness or pigment change, will subside in time. However, there is a risk of the skin overheating from the light, which can cause blistering or bad scarring, and since your skin will be vulnerable and tender there is a risk of infection. If you think you see any signs of these, contact us immediately. Bear in mind that darker skin tones are more at risk to blistering and scarring than light ones, as they contain more pigment which may absorb the light. There are a number of steps you can take to avoid side effects and complications after IPL hair removal. At your first consultation we will take measures to make sure you are not at serious risk of complications, such as by performing a test patch on a small area of your skin. If you are suitable for IPL, the risk of complications should be quite low. To ensure there are no serious side effects, we will use some cooling gel. For IPL/Laser hair removal you often require multiple sessions between 6-10 however this may wary and require more sessions. Treatment is carried out every 6-8 weeks. We offer 20% discount on a course of 6 sessions paid in advance. After 6 sessions a maintenance cost is all that is required per session thereafter. 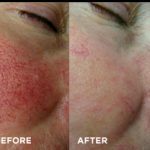 IPL systems release precisely controlled short pulses of filtered light that stimulate the fibroblast cells within the skin that produce collagen and elastin. In addition specific lesions such as thread veins, age spots and freckles can be targeted resulting in a more uniformed completion. The skin becomes firmer, appears more radiant and enlarged pores are reduced. Nd:YAG Laser may be selected to target deeper lines and to promote further collagen production.